The Stonewall Chamber of Commerce hosts their Annual Hunters Dance; come out and celebrate an evening of fellowship and live music. The Stonewall Chamber of Commerce is at 115 St. Francis Street in Stonewall. Call (830) 644-2735 for more information. View guns, knives, coins, ammo, jewelry and German war relics at Fredericksburg Event Center, 224 FM 2093 (Tivydale Road). Cost is $5 per person. Hours are Saturday 9:00AM - 5:30PM and Sunday 9:00AM - 4:00PM. Please call 830/990-1010 for more information. Join the Heritage School, new owners of the Eisbahn Ice Skating Rink, at a kick-off party on Tuesday, November 25 from 6– 9 pm at the Marktplatz to celebrate the Eisbahn’s 4th season of good times in Fredericksburg! Cost is $20 for adults and $10 for anyone age 18 years and younger. Enjoy a silent auction, local cuisine and half-price skating. Tickets are now available at Tea Rose Home, Der Kuchen Laden and at the Hill Country Dry Clean Super Center. For details, call 830-992-9659. Love Thanksgiving but hate the kitchen mess? Let the Cabernet Grill serve your Thanksgiving feast on Thursday, November 27 from 11:00 a.m. until 4:00 p.m. Cost is $27.95 per person plus tax and gratuity. There’s open seating, so no reservations are needed that day at the restaurant located at 2805 S. Hwy 16, in Fredericksburg. Menu includes an assortment of meats, vegetables, salads and warm, hearth baked rolls. Dessert fans will delight in the Dessert Bar with its variety of treats! For details, call 830-990-5734. Here’s an opportunity to squeeze in a few hours of shopping locally as many shops within the Fredericksburg Historic District stay open until 8:00 p.m. on Friday, November 21 for your shopping convenience. The Argentine Restaurant Now Open! The Argentine Restaurant is now serving up a wide array of meats—like lamb, goat and beef, each cooked and served in the Argentine manner. Located at 803 S. Adams, Fredericksburg, the restaurant is open Thursday through Monday from 5:00 – 10:00 p.m. and on Sundays from 11:00 a.m. until 10:00 p.m. Enjoy live music on weekends and Tango dancing on Fridays and Saturdays. For information, call 830-997-0407. The Art of Sculpture, a month long celebration of 10 bronze artists and their works, begins Saturday at Whistle Pik Galleries, 425 E. Main Street. This event is free and the public is welcome. Please call 830/990-8151 for more information. Note: Information provided by above restaurants. HEB Food Store (830-997-9950), 401 S.
(997-4346), 206 N. Milam, will be open 7 am - 2:30 pm on Thanksgiving Day. business is derived from alcohol sales. Thunderbox Road is a new art exhibition is underwritten by Sand Creek Post & Beam of Texas and Cedar Eaters of Texas. Their love for farm and ranch architecture inspired them to build 12 outhouses (also called Thunderboxes) and send them to 12 of the top artists in the Hill Country. The artists were asked to showcase their work on the Thunderboxes and created the 12-piece exhibition that will go throughout the Hill Country until May of 2009, when they’ll be auctioned at the Museum of Western Art in Kerrville. The first stop is Grape Creek Vineyards, east of Fredericksburg on Highway 290. The thunderboxes will be on display from November 8 until November 20. Think gas conservation, think scooters! A new ‘scooters and more’ shop has opened in Fredericksburg at 1318 S. State Why 16 – Moto Scootique. Hours of operation are Tuesday – Saturday from 10:00 a.m. until 6:00 p.m. and open other hours by appointment. For information, call 830- 997-1116 . 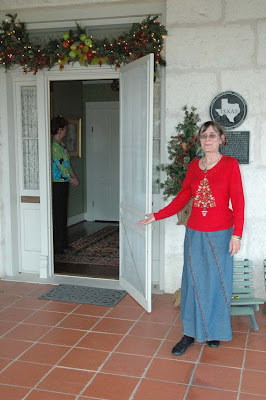 The Gillespie County Historical Society has announced the Fredericksburg properties that will open their doors to the public during this year's Preservation Weekend, held Dec 12 and 13, 2008. 117 West San Antonio St.
Properties will be open between 1:00 and 6:00 p.m. on Saturday, December 13, 2008. All are located in and around Fredericksburg. Tickets for the tour are $25 per person. For an additional $18, visitors can reserve rides on the trolley that shuttles from door to door. Trolley seating is limited, so guests are encouraged to reserve early. The Society will host the Tannenbaum Ball, set for Friday, December 12, from 7:00-11:30 pm at Pioneer Pavilion, Lady Bird Johnson Park, Hwy 16 South of Fredericksburg. This year's theme is "Winter Wonderland," with entertainment by singer Linda Petty. Guests will enjoy cocktails and reserved dinner seating. They can also shop at a new "German Christmas Market," featuring silent and live auctions. Ball reservations are $100 per person, and must be made by December 5. The Home Tour and Ball are the largest fundraisers for the Gillespie County Historical Society, whose mission is to preserve and tell the story of Fredericksburg’s unique cultural heritage. Sherri Knight will be a Berkman Books on Thursday, November 13 from 5:30 – 7:30 p.m. signing her book, Tom P’s Fiddle, a true tale of a reluctant Hill Country desperado. In addition to writing, Mrs. Knight is a history teacher, researcher, speaker and family archivist. From 6:00- 6:30 that evening, Mrs. Knight will talk about family research techniques. Berkman Books is located at 416 E. Main St. in Fredericksburg. Cellist Karla Hamelin will play at a fundraising concert for the Ambleside string program. The Concert to Benefit Strings is Friday, November 14, 7:00-8:00 p.m., followed by a reception. A free-will offering will be taken at the door. Invite others in the community to attend this special event. For more information call (830) 990-9059. Fredericksburg Culinary Arts presents updated twists on family favorites at Fischer & Wieser's das Peach Haus, 1406 Highway 87 South Saturday from 3 to 5 pm. Cost is $50 per person. Please call 512/905-7737 to make a reservation.